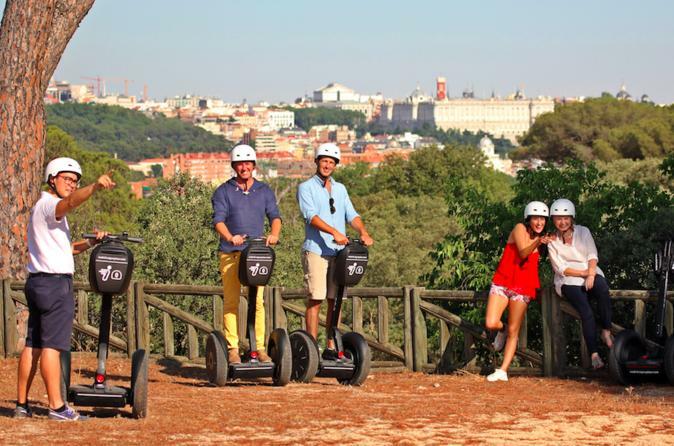 This 90-minute Segway Tour leads you off-road to explore Madrid’s largest urban park. A team of well-trained guides and dedicated staff invites you to glide gently through the small paths of Casa de Campo and the banks of the Manzanares river in the most quiet and peaceful atmosphere. The occasion to experience the perfect balance between Madrid's natural and cultural atmosphere. Your 90 min Segway Tour starts at the Cervantes monument at Plaza de España, dedicated to the writer of one of the world's greatest literary masterpieces - Don Quijote de la Mancha. Starting the itinerary on San Vicente slope, your guide will first take you to the Madrid Río Park, with ten kilometers of pedestrian routes as a result of the ambitious environmental restoration of the Manzanares river banks. You will glide along the edge of the Campo del Moro royal gardens and discover the underground passageway that connected the royal palace and the Casa de Campo park. After traversing the architectural ensemble that includes the Puente del Rey bridge and gate and enjoying the magnificent views of the royal palace from this side of the river, the tour continues on small paths in a quiet and peaceful atmosphere until reaching the Cerro Garabitas viewpoint, which overlooks Madrid’s major monuments. While riding through the landscape full of pine trees and robles - typical for Central Spain - your guide will also comment on the history of the Spanish Civil War, whose remains can still be seen in the Casa de Campo. To conclude, you will make your way along the oldest bridge in town - Puente de Segovia - and have a look over major landmarks, such as the King´s Esplanade and the Virgen del Puerto chapel gardens, before returning to the city center.